Up-and-coming Aussie Jordan Thompson uses a Babolat Pure Drive to get those massive kick-serves and hit that whopper of a forehand. Today I watched talented Aussie youngster Jordan Thompson play Georgian Nikoloz Basilashvili in Sydney today (I wasn’t actually in Sydney, but watched it from the treadmill at the gym). Both guys are born 1994 and pack pretty big ground stokes (which has nothing to do with which year you’re born of course). It was a decent match, but if you’re out to watch long rallies you’d be better off with Djokovic vs Murray or some all-Latin clay court match from the 80s. In the end Thompson won the match simply because he was the more consistent of the two and Bashilashvili made some unforced errors with footwork that I could sadly relate to. Who will advance the furthest in his tennis career remains to be seen, but based on recent results, I’d go with Thompson (he won the doubles title in Auckland together with Kokkinakis). Anyway. This was a long way to get into what gear they use, which might be why you’re here in the first place. 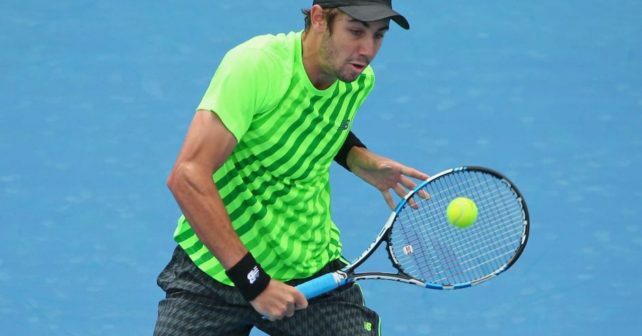 Jordan Thompson uses a Babolat Pure Drive (GT 2014) to create that massive top spin he gets on the ball. Especially his serve looks rather lethal and the second serve kicks up like an angry horse. Thanks to reader West Loh who owns one of his racquets, he has informed me that Thompson uses Babolat VS Touch and RPM Blast strings (a great hybrid setup – get it here ). Thompson’s racquet is weighed up to 355 grams strung so quite a beast to swing. Nikoloz Bashilashvili endorses a Head Prestige racquet, but judging by pictures it doesn’t look like the latest line, but rather a good old PT57A, as used by Andy Murray and tons of other pros under various paint jobs. 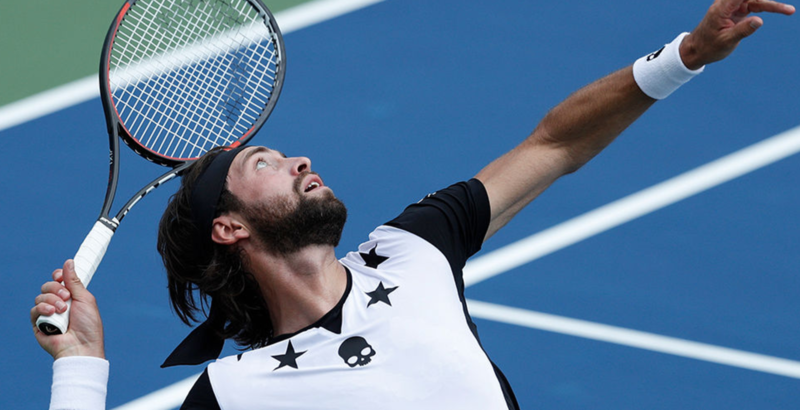 What I do now is that he uses the same apparel as a certain Fabio Fognini – Hydrogen.